When in contact with a hot object, our immediate response is to withdraw our hand. This instinctive reaction is an example of how external environment shapes our actions. In a similar fashion, bacteria are constantly monitoring and responding to the physical (Temperature), chemical (pH), and biological (presence of other organisms) conditions in the environment surrounding them. This response is mediated towards maximizing their chances of survival and growth. For example, when bacteria perceive glucose in the environment, only then do they start making proteins necessary for glucose utilization. In absence of glucose, the bacteria do not waste resources towards making such proteins. Fig. 1,. An example to show the diminishing return of satisfaction from eating N candies and the associated cost. 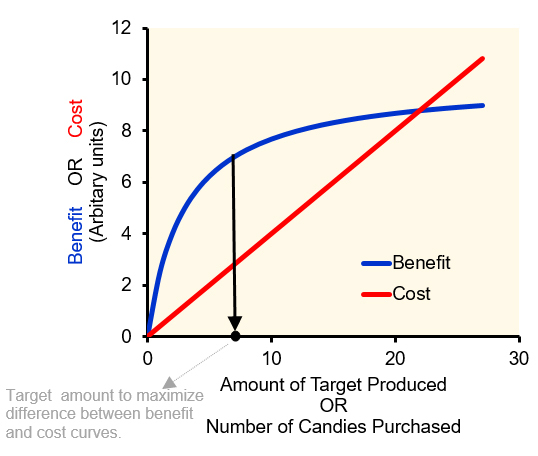 The candy example mimics the benefit and cost associated with protein production in a cell. So, in response to the environment, only proteins which aid proliferation or survival are produced. But, producing these proteins has a cost associated with it. This cost includes energy expenditure, consumption of available resources etc., and cost is directly proportional to the number of proteins synthesized. On the other hand, the benefit associated with production of these proteins is known to look like a saturating function as shown in Figure 1. These curves can be best explained using the following example. Imagine there are candies costing ₹1/ piece. As an individual, I am supposed to make a choice of how much should I spend on these candies. From experience, I know that the first candy is the most satisfying. The second one slightly less so, and by the 10th candy, the satisfaction derived is minimum. Hence, the total satisfaction derived from having eaten ‘k’ candies is a saturating graph as shown in Figure 1. 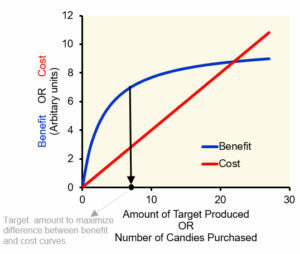 Since cost is directly proportional to the number of candies purchased, the cost function looks like the one in Figure 1. The same logic is applicable to bacteria responding to environmental conditions – where cost of candies is replaced by cost of producing proteins; and the satisfaction derived from the candies is replaced by benefit to the cell. So having these curves, how does one decide how many candies to eat, or in case of bacteria, how strong a response to launch towards the environmental stimuli? It’s apparent from Figure 1 that we/bacteria would operate at a level where the difference between the benefit and the cost curves is maximum. Now, having identified the number of target molecules needed, the bacterium needs to figure out how to accomplish this in response to environmental cues. The synthesis of target is dictated by a large number of cellular processes. 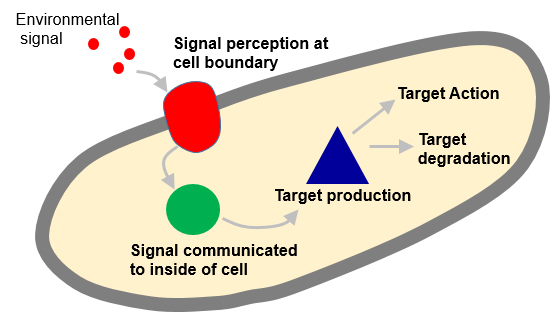 These include: (i) transmission of external signal to inside of the cell; (ii) the sensitivity of the response (i.e. target synthesis) to the perceived signal, (iii) the rate at which target is degraded etc., as shown in Figure 2. In a biological context, these processes are dictated by parameters which can take values in a range dictated by the thermodynamics inside a living cell. Fig. 2. The many steps towards target production in a bacterium. Each of the steps indicated by arrows is modulated by a number of cellular parameters. Via mutation, each of these parameter values can be altered. The cell can operate at optimum target production (as shown in Figure 1) by an infinite number of combinations of these parameters. Hence, in this study we identify the uniqueness of the parameter sets which enable a cell to operate at the target value as shown in Figure 1. Through our analysis, it is seen that a cell has an infinite number of choices of parameter values, each enabling it to operate at a specified target value. A bacterium can alter the parameters associated with control of gene regulation and still be able to operate at optimal levels. This is likely important from various perspectives, for example, a bacterium could potentially encounter the effect of a stress (such as antibiotic) by any of the large number of possible alterations. Therefore, there are multiple solutions for the challenges proposed by the environment. Optimal parameter values for the control of gene regulation.